- Our Polishing Pads are ideal for granite, marble or any other natural stone with WET and DRY versions available. These pads have the high diamond concentration for long lasting durability that will not disappoint. - The high-quality diamonds are bonded to the core using DX brazing technology, ensuring lasting performance, cut after cut. DX Technology Now for High Speed Saws! - The DiamondX Cutter series now has a 14 inch blade designed for high speed saws. This newly engineered blade is reviewed in a 2 page PDF that goes over the features and the advantages over abrasives. - The new RAIL-PREMIUM and RAIL-SUPREME blades are specifically designed to cut rail track. They are versatile and provide great all around performance at a lower cost. - Edmar introduces the new Roadrunner series of thin abrasive blades in Type 1 and Type 27 configurations. Now get the best lifetime and cut speed for the best price. - New regulations may require contractors to use vacuum dust collections systems when grinding stone or concrete. This document details the height profiles for all Edmar cup wheels and similar cup grinders or polishers for compatibility with vacuum systems. - We now have a supply of display boxes for sales counter exposure. This is a good way to show off 12 or 14 inch Edmar blades at the point of sale. Contact us for details. 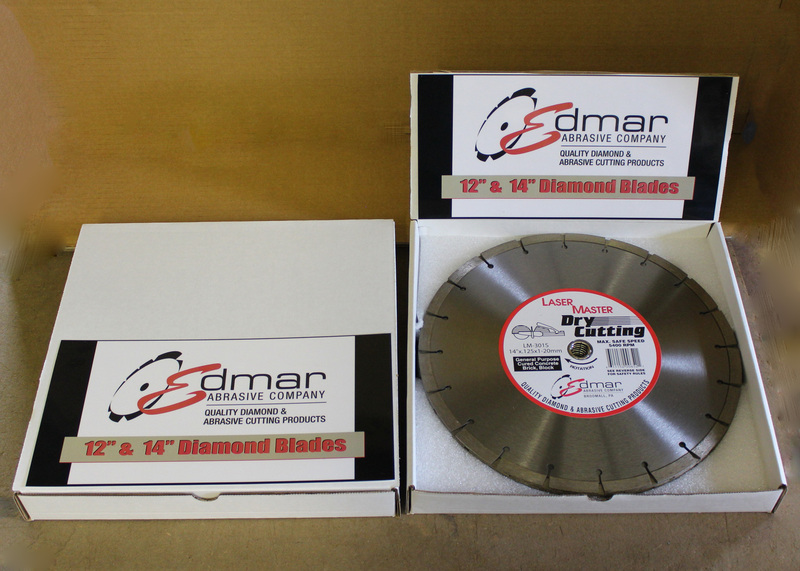 - 2 page flyer on Edmar early entry blades with Advanced Ceramic Technology for Soff-cut type saws.